Frank Sinatra didn’t really care for the “Rat Pack’ reference, but the name was of no import. It was all about a bunch of “palies” getting together to have a little fun, play a little music, tell a few irreverent jokes, and well, fans just happened to be there for the experience of a lifetime. Their shows were unplanned and impromptu. There was no script to speak of, no set list. Sinatra might be playing one side of Vegas while Dean Martin was on another, and Sammy Davis Jr., more than likely, was somewhere in the middle. None of them could ever have known how much a group of guys getting together more than 60 years ago to sing and goof around with each other would still “fly” on today’s somewhat fragmented entertainment scene. The fact that shows still pay tribute to Frank, Dean, and Sammy, a.k.a. 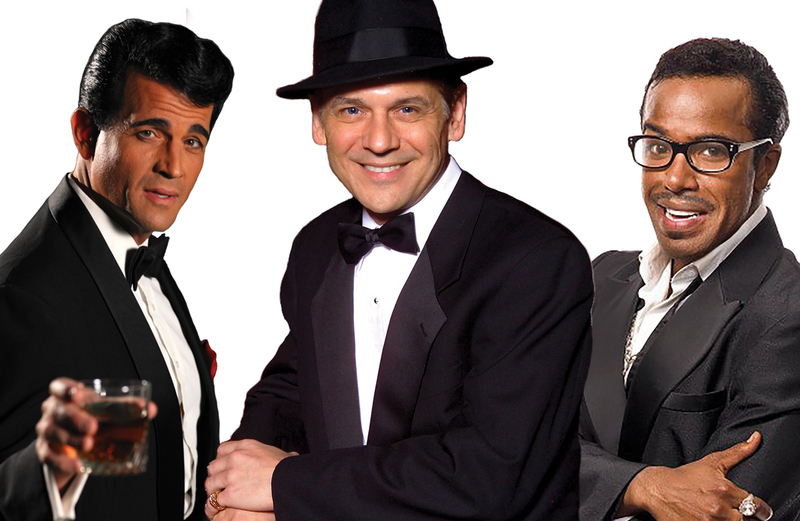 “The Rat Pack,” speaks volumes to the timelessness of what they created. A tribute to the guys is coming to the Avi Resort & Casino on Friday, Dec. 7, in the Avi Grand Ballroom. The magic was in the entertainers themselves, and the camaraderie they enjoyed and shared. They were just a bunch of guys singing, goofing around, taking humorous pot shots at each other, and most of all entertaining crowds. That is the stuff of the modern tribute shows and the reason for their success. But in order to pull off that magic and recreate that natural charisma, the talent has to be rock solid. It requires more than a cast who happens to resemble Frank, Sammy and Dean. Anzaldo, Brooks and Edwards guys in capture all of it because they’ve perfected their craft over the years in various tributes. For example, Anzaldo was here not long ago in a Harrah’s Laughlin show based on the question, “What if?” What if Sinatra and Barbra Streisand were to share the stage as a concert duo? So Anzaldo and Sharon Owens created “Barbra and Frank: The Concert That Never Was,” which has played in Laughlin a few times and was invited back in September because audiences love the concept. Brooks has been nailing the Sammy Davis Jr., vibe for years. Signature songs like “Candyman” and “What Kind of Fool Am I” paired with suave Sammy dance moves seems like he can channel Sammy at will, which he does frequently in sell-out shows all around the world. Edwards’ Dean Martin is nothing new to the Laughlin entertainment scene either. He has been performing the character here for many years. “It’s like this — the Rat Pack is having a party and the audience is invited,” Edwards said. “We break down that invisible wall between the audience and the stage. We don’t perform at them — we perform to them. “It’s all based on that expression, ‘everything old is new again.’ To see it again brings back a lot of history. We’re recreating something that opened the door for variety shows on television and other venues. “It was a live show that started when four guys (often including Joey Bishop) who were in town at the same time, decided to have a little fun together. They were all in Las Vegas filming Oceans 11 and Sammy was playing The Sands. The others would show up and interrupt his act — and it was like lightning struck. It became the premise for all types of production shows. “Unlike a lot of shows that are synchronized to lights and fog and special effects, they were just themselves and an orchestra. They were entertainers — talented entertainers with charisma and a sense of comedy. They didn’t have to plug anything in. This isn’t Edwards’ first rodeo. “I learned the business from the bottom up. My wife and I were in Vegas in 1993 visiting my brother when she calls and gets me an audition to do Elvis. I had done impressions just for the fun of it, but never as a profession. The audition went well and here I am. Understanding the men is critical to portraying the characters, Edwards said. Edwards has a tough time picking his favorite Martin song. “The thing about Dean I loved the most was when I used to watch him on his weekly television show — he was a grown man dressed up in a tuxedo acting like a kid and getting away with it. I would have gotten yelled at if I’d done that. And if he made mistakes, he’d make a joke about it.